This is one Springfield I’ve wanted for some time. I picked it up and immediately went to my small range. Wow, talk about an accurate 1911. I’m sure the 43 ounces helps with fast follow up shots but it’s been put together well. Very good fit of the slide to frame as well as a smooth and crisp trigger pull of about 4.5 pounds. The Novak night sights give an excellent sight picture as always. The ambi-safety is crisp and sure. One thing I appreciate about Springfields guns is that depression of the grip safety is never a problem to depress. With some brands you have to really get a firm grip to make sure you depress the safety. 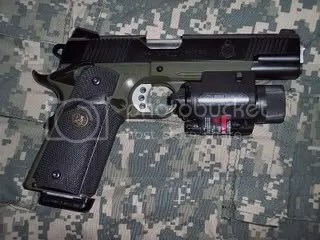 With the Springfield and a high hold with my thumb resting on top of the safety I release it without problem. 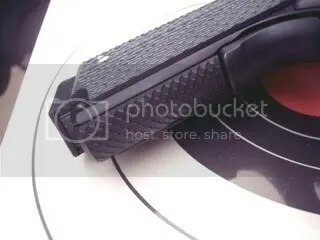 Nothing is as frustrating as trying to pull the trigger and you discover the grip safety is still engaged. You might think that at 43 ounces it would be a real bear to carry concealed but with a Milt Sparks “55BN” holster it really isn’t. I carried it for several days and found it to be very easy to carry. The Sparks holster is a special order item to accomodate the rail. At the range I paced off 15 yards and fired 50 rounds. You want to shoot more but at under 20deg you tend to change your mind pretty fast. I set a 5 inch target up and from a standing position put all 50 rounds into one hole about 2 1/2 by 2 1/2 inches. Not to shabby for an unfamiliar gun when your getting used to the change in trigger and weight. I normally like to shoot at least 200 rounds before I write anything about a new gun but with the weather in northwest Missouri–well you understand. Even with just 50 rounds I had no malfunctions of any type even though after getting home I found the gun devoid of any lube to speak of. All the brass fell within about 2 feet of each other. This a picky point with me. An extractor that isn’t very well adjusted will toss brass all over but not this gun. That means somebody at Springfield was paying attention to their job. That’s nothing unusual for this brand of gun. This is the first gun I’ve purchased an Insight Technologies light/laser combo for. Outside of driving our cats nuts with the laser it does serve a purpose:-) If you want to keep this gun handy for home defense you won’t find a better accessory. With the included hex wrench all you have to do is adjust the laser at 10 to 15 yards to rest at the top of the sight picture. This is easily done with the Novak night sights doing there job. So, in pitch black with the sights glowing and a laser you’re pretty well assured of hitting what your aiming at. Add to that a 125 lumen white light and it’s just one handy piece of equipment. The laser/light combo weighs only 3.5 ounces so it doesn’t add any heft to speak of. 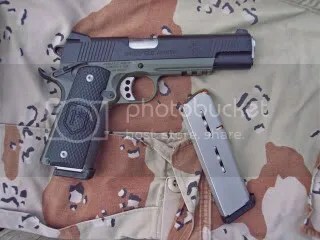 This is a fine gun that I’m adding some of Mil-Tacs fine grips to. 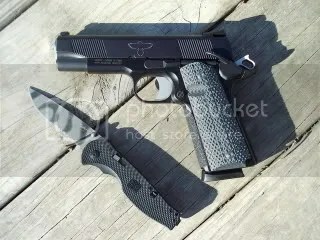 That’s really all I need to do to have a really great gun for competition, defense or just enjoying time on the range. I recently purchased this S&W Gunsight version 1911. It’s a lightweight frame with forged slide. I changed out the grips for a set made by Mil-Tac knives called G-10’s. They provide an excellent grip no matter the weather. The mainspring housing was a MIM part that I changed out with an Ed Brown “Snakeskin” type. Coupling the grips,MSH and skateboard tape on the front strap and you have one solid grip all around. After shooting 250 rounds (now 1200 rounds) through it I experienced no malfunctions of any type. The ACT/Novak mags that come with the gun are excellent. They are very smooth and feed correctly every time. I intend to use these mags and the new Wilson Elite Tactical mags on all my 1911’s. I plan on buying Wollf mags which are the same thing with the exception of having a Wollf spring. I also like the Novak sights which have a brass bead on the front sight. I find this really easy to pickup especially for those of us over 50 years old:-) I highly recommend this gun especially for daily carry.